Be sure to get hold of the May/June issue of Handwoven! A package has been sent on to the Staffordshire Moorland’s Guild of Spinners, Weavers and Dyers, UK. 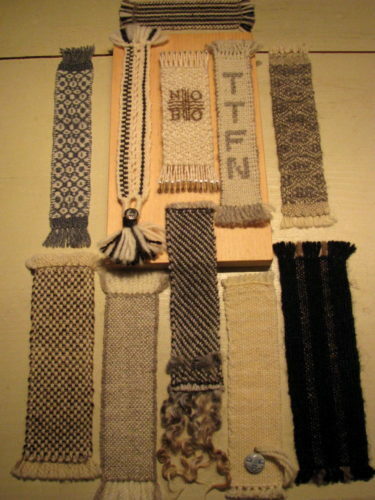 I included their collection of NOBO’s woven bookmarks, a copy of Handwoven, and our flyer. This completes our Old England to New England rare British sheep breed bookmark exchange. Onward to our internal table runner exchange focusing on rare American sheep breeds!